Adjustable output / working pressure. Pisco needle valve for ultimate dosing control. Note: Does not have a solenoid. The Single stage regulator with adjustable pressure will reduce the high pressure of a CO2 cylinder to a lower and usable pressure. The ability to adjust the working/output pressure ensures the regulator will be able to meet the needs of any homebrew enthusiast. A high-precision Pisco valve is fitted as standard, which gives you easy and incredibly accurate control of CO2 dosing. It also has a pressure gauge that displays the output / working pressure, which can be adjusted by means of the pressure adjuster knob. Tighten the regulator to your CO2 cylinder using a spanner or wrench. Do not use your hands to tighten, it will not create sufficient seal and be likely to leak. 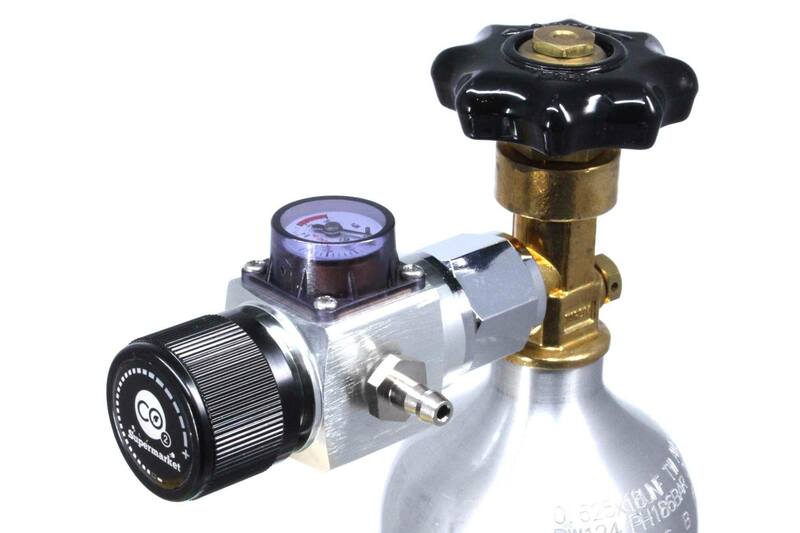 Open the flow of gas from your CO2 cylinder. The cylinder pressure gauge will now indicate the pressure of the cylinder. Turn the pressure adjuster clockwise until your desired output pressure is set. Nice, reliable and does his job. Nice, reliable and does his job. Excellent small regulator, works beautifully. Excellent small regulator, works beautifully.